With the proclamation of these words, etched on the back of the Saint John's University President's Medal, Colleague Jo White was awarded this "distinctive and well-deserved honor" for her "life-long devotion and commitment to the calligraphic arts, as well as her principle role in the genesis of The Saint John’s Bible." 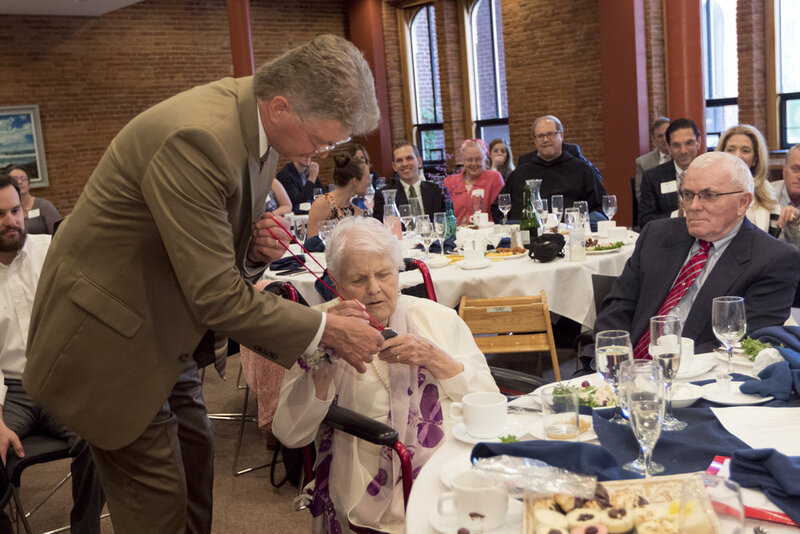 Jo received the Medal, and Presidential Citation, surrounded by husband Bob, their children, grandchildren, great grandchildren, and dear friends on the torrentially rainy Sunday morning of June 11, 2017, at Saint John's University, Collegeville, MN. 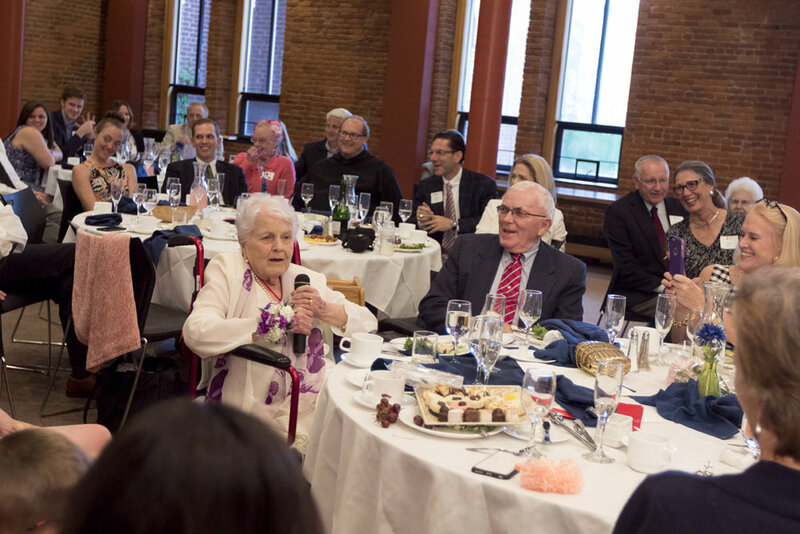 There was only sunshine and buoyant spirits, however, among those assembled to see her receive the honors at a Founders Room luncheon after Mass. Several members of the Colleagues of Calligraphy attended. 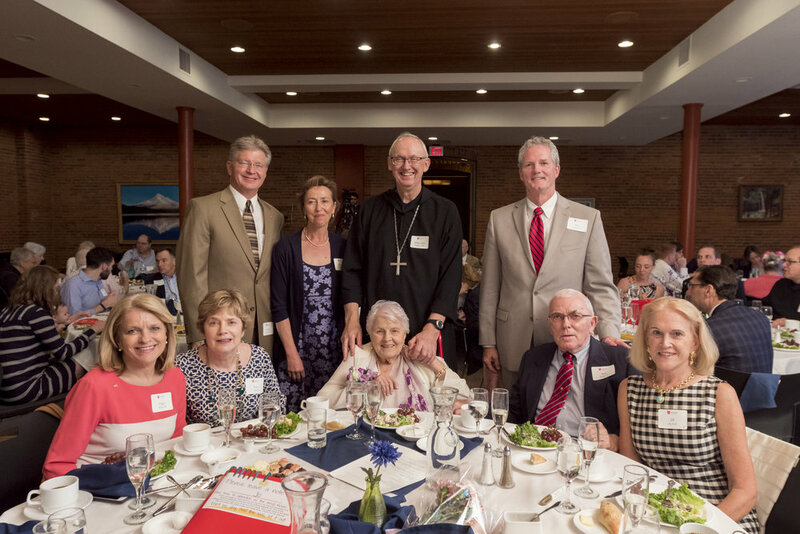 "It is not an overstatement to say [The Saint John's Bible] would not have happened without Jo," said Saint John’s President Michael Hemaseth during the program he hosted, emceed by longtime family friend Rob Culligan. 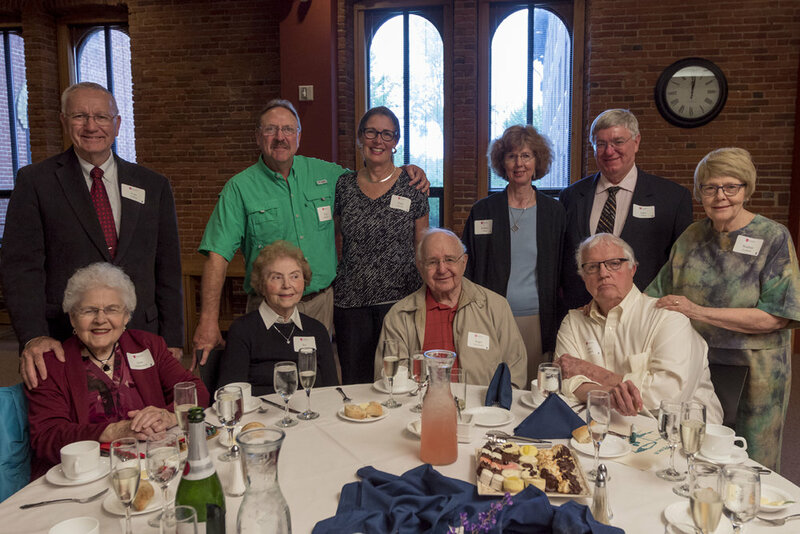 A rich slide projection of images and memories lovingly prepared by Jo’s daughters opened the storytelling, with piano accompaniment by Father Bob Koopmann, OSB, playing his own original compositions. A portrait emerged of a woman who is at once wife, mother, neighbor; teacher, calligrapher, colleague; organizer, deal maker, friend; and "Wisdom Woman" in the moving tributes to Jo that followed. 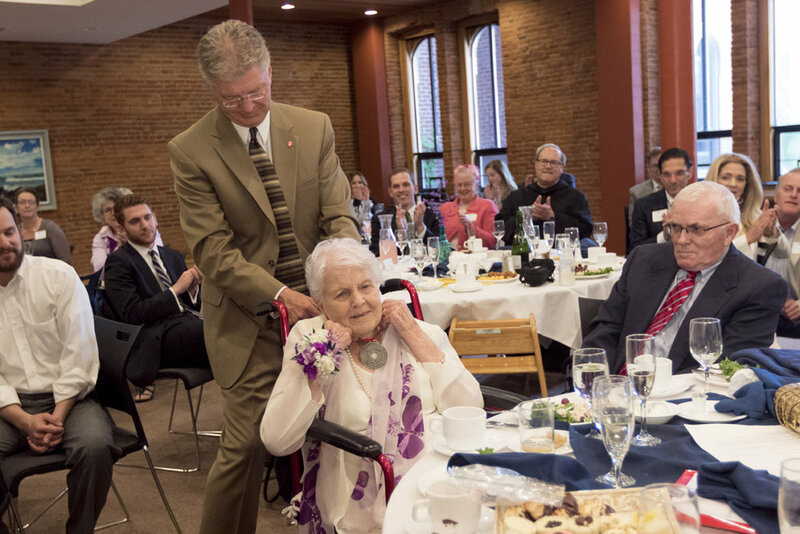 President Hemaseth described Jo as a “true friend of Saint John's University…embodying the cultural, artistic, creative, entrepreneurial spirit” of the institution. Father Eric also noted that in very practical terms, Jo's efforts put people to work in a meaningful endeavor. When it came to Donald Jackson's original personal dream of a millennium bible for Saint John's, “yet again, in the beginning was Jo!” President Hemaseth continued reading from the letter: "It can truly be said that for more than forty years Jo has been acknowledged as a formidable ambassador for western calligraphy and the lettering arts. The Saint John’s Bible is one of the fruits of her energy. But it is to Saint John’s and The Saint John’s Bible she has always given her heart." 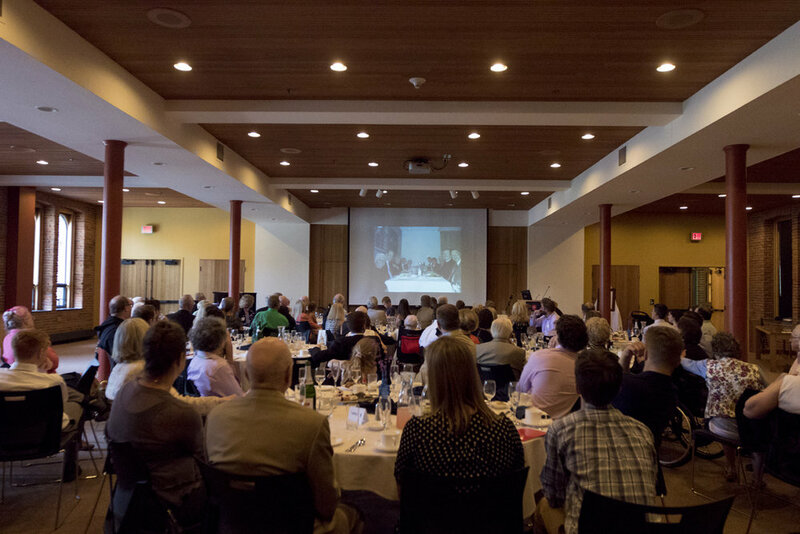 When handed the microphone to say a few words, Jo’s gratitude extended to the many from her life who were not present to share her joy in the day: "I'm thinking of the ones that aren't here today that were the wind beneath my wings, and that has been my education…It's been a great ride." 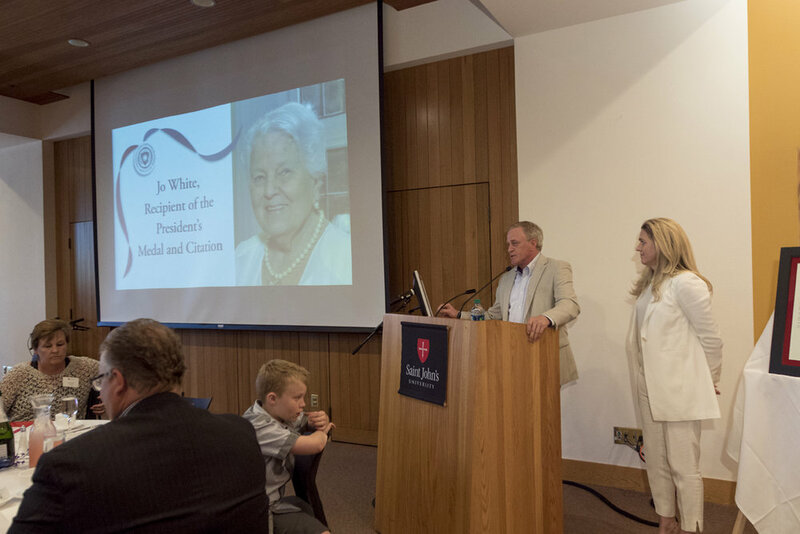 The program featured final remarks and insights about Jo by daughter Judy, and son Jim. The Bible, Medal, Citation, and the gathering of friends present that day did not simply "happen by accident," Jim noted. Emphasizing that what may seem extraordinary to some was simply the way Jo operates, Judy said. "If something needed to be done, she just did it…in the White house, that is our normal, and that normal is extraordinary." 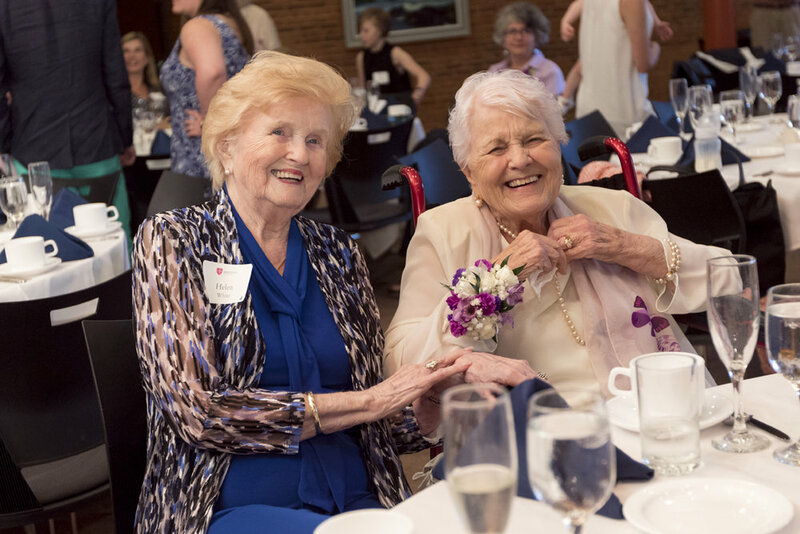 And for all who have known, loved, and been touched by Jo, the truth of Jim's loving observation of his mother echoes beyond that day: "If you've ever had the good fortune to unwrap and live in one of her gifts, it will live in you."